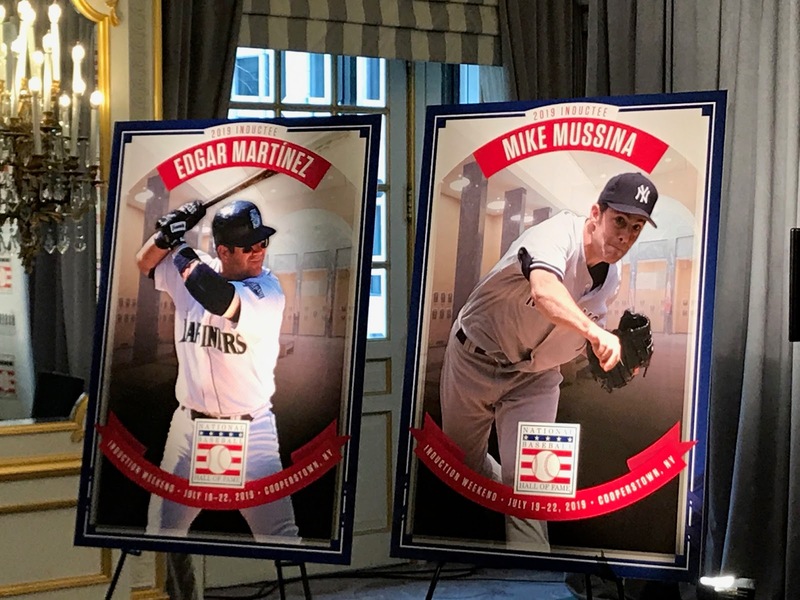 Edgar Martinez, Mike Mussina, and Mariano Rivera. Yankees legends Mariano Rivera and Mike Mussina, along with Edgar Martinez, who starred for the Seattle Mariners, the newest members of the Baseball Hall of Fame, met the media on Wednesday afternoon at the St. Regis Hotel in Midtown Manhattan. 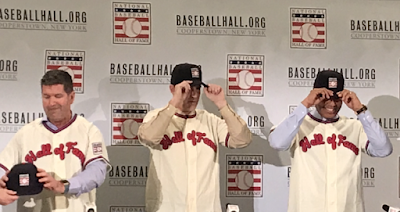 The late pitcher Roy Halladay, who played his career with the Toronto Blue Jays and Philadelphia Phillies, was also elected, and he was represented by his family on Wednesday afternoon. Rivera was the first-ever unanimous selection, achieving it in his very first year on the ballot. The highest percentage received by any candidate in the 75 previous BBWAA elections was Ken Griffey, Jr., who received 99.3 percent of the vote in 2016. Halladay earned 85.4 percent of the vote in his first year on the ballot. Martinez also got 85.4 percent in his 10th and final year on the ballot. 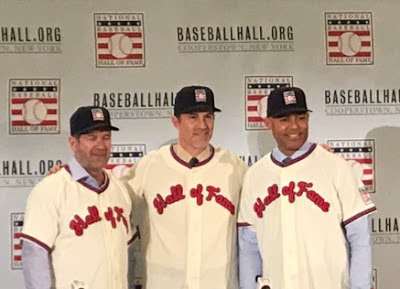 They are the second BBWAA electees in the same election to receive the same number of votes since Babe Ruth and Honus Wagner tied with 95.1 percent of the vote in the inaugural election in 1936. 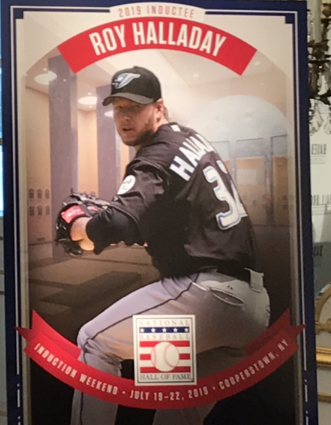 Halladay, who passed away in November 2017, is the sixth player posthumously elected by the BBWAA by standard election procedures. Christy Mathewson (1936), Willie Keeler (1939), Herb Pennock (1948), Harry Heilmann (1952), and Rabbit Merenville (1954) were also elected after their passsing. Roberto Clemente was elected posthumously in a special BBWAA election in 1973, right after his passing on December 31, 1972 in a plane crash while on a relief mission to Puerto Rico. 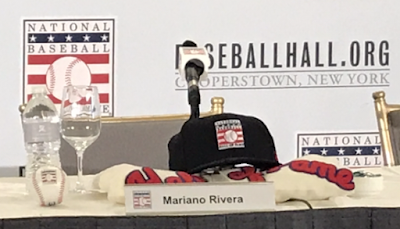 Martinez becomes the fifth player to be elected to the Hall of Fame by the BBWAA in his final year of eligibility, joining Red Ruffing (1967), Ralph Kiner (1975), Jim Rice (2009), and Tim Raines (2017). 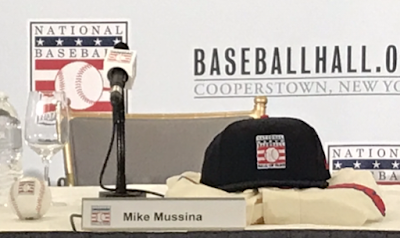 Mussina earned 76.7 percent of the vote in his sixth year on the ballot, clearing the 75-percent threshold for election by 1.7 percent. Since Mussina nearly split his career in half between the Yankees and Orioles (8 seasons in New York, 10 in Baltimore), he said he has not decided what cap he will wear. 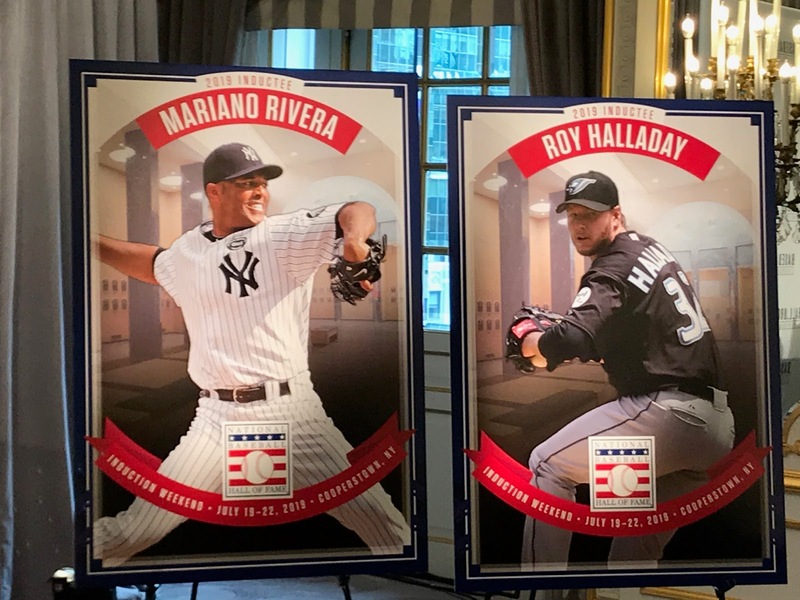 The election of Rivera and Halladay brings the total of first-year BBWAA inductees to 56 and marks the sixth straight year with at least one first-ballot inductee, the first such stretch since a run of eight straight years from 1988 to 1995. Rivera said on Wednesday, "I want to start by thanking God for this great achievement. It would have been impossible for me to achieve this without his help, so to my wife and family, baseball writers, you guys are the best. Just a privilege, I remember coming from a small fishing village called Puerto Calmito in Panama, and just being here speaking at the Hall of Fame is something that my mind can't comprehend, but at the same time, the Lord, he allowed me to make that happen. 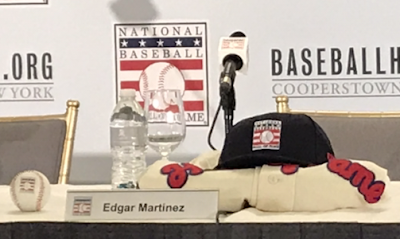 Referring to the fact that Martinez hit .579, or 11-for-19, against him during his career"Edgar will have to take me to dinner, maybe tomorrow, one of these days because of me, his average was better," which he said to laughter from the audience. "So therefore, you owe me dinner. "I am so happy to see these men here, I mean Edgar, Moose, and Halladay, his family, those guys made me better. I remember speaking to Halladay, and you owe me another dinner," he said to Mussina. "In 2008, Halladay and myself, we were talking in the outfield about pitching, we always talk about pitching, and I was teaching him the grip of the cutter, and he did, actually he was throwing the pitch, and Derek (Jeter) and all the hitters from my team were mad at me. As a matter of fact, I got fined by our Kangaroo Court because Halladay was so good against us, and they blamed me, and I said, 'you guys didn't hit the ball, not me!' Amazing that I'm here talking about the Hall of Fame and, again, thank God for that." Putting on their caps for the first time. 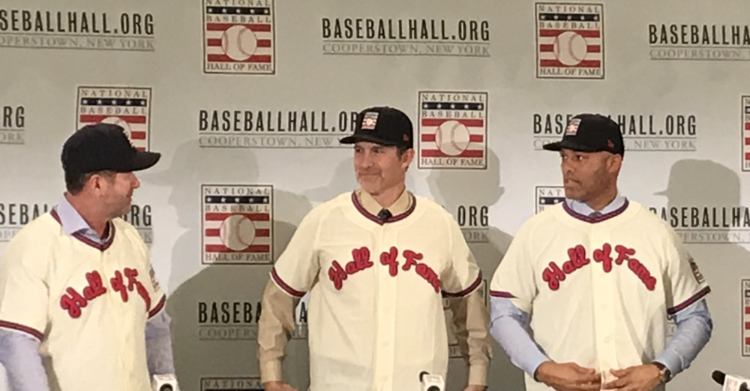 Mussina said, "Obviously, we want to thank everyone, really surprised I'm even here this year. Caught me off guard quite a bit, but everybody's support from the first year (he was on the ballot), and I want to say thank you to the 20 percent that voted for me the first year - that kept me on the ballot so I could move my way up slowly. So, thank you to those guys and thanks to everyone for supporting us. We all appreciate it, especially me and Edgar, guys that have been on the ballot for a few years, it's a tremendous honor. It's a long time since I sat in a press conference with all these cameras flashing in New York, but it's just as exciting as it was the first time I came. I'm thrilled to be considered with the other great players in the game, with the guys I'm sitting with. 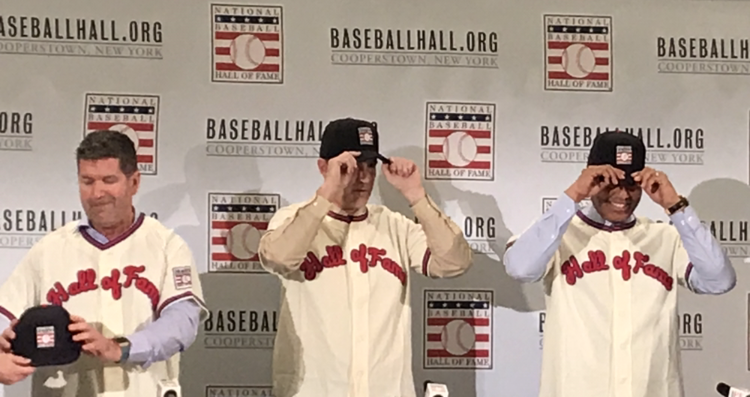 Thanks to everyone, and congratulations to my teammate and my new teammate, to the Halladay family, and it's just a great honor." Martinez said on Wednesday, "I would like to say thank you to the writers for giving us support all these years, especially this year. This is a great honor, the ultimate honor as a baseball player. To play the game and to win every year, but at the end, it's a lot of work and this is the highest honor. I would like to congratulate Mike and Mo, and Roy's family, for this great honor. Congratulations." Rivera, the greatest closer in history, amassed a record 652 saves and 952 games finished in 19 seasons with the Yankees. A 13-time All-Star, he led the American League in saves three times and finished with 40-or-more saves nine times, a record he shares with Trevor Hoffman. The Yankees won five World Series championships and seven American League pennants with Rivera anchoring the bullpen.In 96 postseason appearances, Rivera was 8-1 with 42 saves and a 0.70 ERA, winning World Series MVP honors in 1999 and ALCS MVP honors in 2003 when he pitched three innings in relief in the decisive Game 7 against Boston. The Yankees made the postseason in 16 of his 19 seasons, starting with his rookie year in 1995 until he retired in 2013. 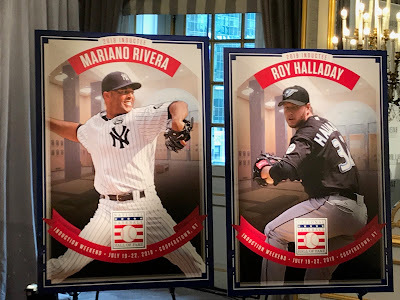 Rivera's career ERA of 2.21 is the lowest of any Live Ball Era pitcher with at least 1,000 innings pitched, and his career WHIP (walks and hits per innings pitched) of 1.003 ranks third all-time behind Hall of Famers Addie Joss and Ed Walsh. Mussina pitched 18 seasons, 10 with the Baltimore Orioles (1991-2000) and eight with the Yankees (2001-08). He is one of just four Live Ball Era pitchers with at 270 wins and a .625 winning percentage. He won at least 10 games in 17 seasons, including his 20-win season in his final season, 2008, at the age of 39, the oldest pitcher to ever achieve that. He made 59.5 percent of his regular season starts in Yankee Stadium, Oriole Park at Camden Yards, and Fenway Park, playing for teams in the American League East his entire career. 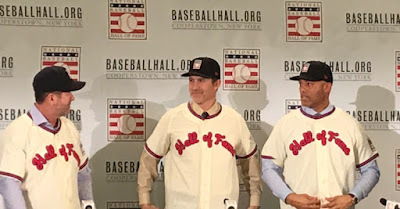 Mussina was an All-Star five times, was a seven-time Gold Glove Award winner, and finished in the Top 6 of the American League Cy Young Award voting nine times. Martinez, who played his entire 18-year career for the Seattle Mariners, was a two-time American League batting champion who led the AL in on-base percentage three times. He was also a seven-time All-Star and five-time Silver Slugger Award winner. He topped the 20-homer mark in eight seasons, drove in 100-plus runs six times and hit .300 in 10 different seasons. A third baseman at the start of his career, injuries pushed Martinez into a designated hitter role, where he thrived for a decade. He was named the American League's outstanding DH five times, an award that now bears his name. When he retired, he was one of just six players with a .300 batting average, .400 on-base percentage, .500 slugging percentage, 500 doubles, and 300 home runs. Halladay pitched 16 seasons for the Blue Jays and Phillies, winning the Cy Young once for each team, with Toronto in 2003 and Philadelphia in 2010. In addition, he finished in the Top 5 in Cy Young voting in five other seasons. Halladay was an eight-time All-Star who led his league in complete games seven times, the most of any pitcher whose career began after World War II. He won 20 games three times, led his league in strikeout-to-walk ratio five times, innings pitched four times, strikeouts four times, and victories twice. In 2010, while with the Phillies, Halladay threw two no-hitters, the first a perfect game against the Marlins on May 29 and then a no-hitter against the Reds in Game 1 of the NLDS, making him just the second pitcher to throw a no-hitter in the playoffs since Don Larsen of the Yankees threw a perfect game against the Brooklyn Dodgers in the 1956 World Series.